If you’re finding it harder to suffer through hangover symptoms with every passing birthday, you’re probably chalking it up to your body’s ageing process. It might be a little more complicated than that. 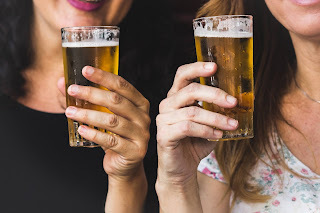 And, as Stephens notes, another difference is that younger people are more inclined to binge drink(defined in the study as having five or more drinks on the same occasion), typically on weekends, while older people exhibit the less hangover-prone style of drinking steadily throughout the week. It might just be that because older people tend to drink more sensibly, thus avoiding frequent hangovers, it surprises them when they do get a hangover, leading to the perception that their symptoms are worse than they were when they were younger. Although many aspects of hangovers remain a mystery, it’s clear that they’re no fun and definitely worth preventing. Consider opting for light drinks over dark ones—they tend to have fewer congeners, which are chemical substances that help give booze its flavour and might exacerbate hangovers. Listen, we know you might scoff at these tips. But if you want to avoid that so-hungover-my-brain-has-actually-liquefied-and- I’m-never-drinking-again feeling, they’re really worth following.